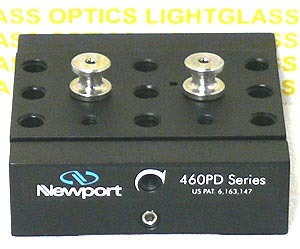 The Newport 460PD-X Modular Dovetail Linear Stage is the basic module in Newports 460PD line of Modular Dovetail Linear Stages...By stacking stages, bases and angle brackets, you can build a custom stage for your application-be it X, XY, or XYZ Axes, or even for mounting at angles... This stage is adjusted with an allen wrench-allowing precision control of the 80 TPI drive screw while providing high stabiliy and...discouraging the "twiddlers" in your lab. When you are satisfied with the position, the stage can be locked in position with the included lock mechanism. The top plate of this stage has been drilled and tapped with both 1/4-20 and 8-32 holes for mounting the Newport PEG modular mounting peg screws or other optical components.